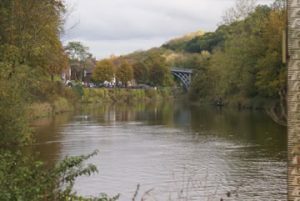 For our October 2011 half term holiday, Cary and I decided to return to a favourite area of ours – the Ironbridge Gorge in Shropshire. I’m originally a Shropshire lad and grew up near the Ironbridge Gorge; although I have been exiled in Merseyside for many a long year! Although both of my parents are dead, I still visit the area as my brother lives in Telford, and at my age nostalgia kicks in. I know the Ironbridge area well, as I grew up in Madeley which is about 2 miles away. For our visit, Cary and I decided to stay at Leo Farm Caravan Club CL Site. I had been planning to visit this site for some time after reading a number of favourable reviews. I contacted Norman Wyke, the owner, by phone a few months before our planned visit. Norman was very helpful, and although he explained that he would be away during our visit he asked me to send him a deposit and post the balance through his letterbox before departing. We left our home in St Helens soon after lunchtime on Saturday 22 October and took a route we know well; using it often to visit my parents when they were still alive. Taking the A57 dual carriageway south to Widnes, we crossed the Mersey on the Runcorn Bridge. We then took the A557; a pleasant road with lovely views over the Mersey Estuary – although one does have to look beyond the extensive chemical works stretched out along the river’s shores. We joined the M56 at Junction 12 and turned south-westwards towards Chester. On reaching Junction 15 of the M56 we turned south onto the M53 to bypass Chester on its eastern side. The M53 leads straight onto the A55, and we followed this excellent dual carriageway until its junction with A483, continuing southwards towards Wrexham. Passing in and out of Wales as the A483 crosses and recrosses the border we made good time on this mainly dual carriageway. The road gives lovely views over the surrounding countryside with particularly spectacular ones on the two viaducts en route. Near Ruabon the road becomes the A5, and we continued southwards. We would have normally bypassed Oswestry, but a road closure on the A5 meant a short diversion into the outskirts of the town. We were not greatly delayed and rejoined the A5 where it turns south-eastwards towards Shrewsbury. This stretch of the journey was a little slower as the A5 is rather twisty until it reaches the dual carriageway section to bypass Nesscliffe. The nearby striking sandstone cliffs which are now part of Nesscliffe Country Park can be seen from the road. I must admit that I have never visited the park although it is a very interesting area with a cave formerly the refuge of the 15-16th Century gentleman-turned-Highwayman, Humphrey Kynaston. There is also an ancient hill fort which can be seen by following the woodland paths to the top of the cliffs. We continued along the A5 and bypassed Shropshire’s county town of Shrewsbury on its western and southern sides. Although we did not visit Shrewsbury on this trip it is a fascinating town, with a castle, wealth of historic buildings and interesting shops set in a loop of the River Severn. The town’s position in the river loop was an excellent defence in historic times with the medieval castle built to protect the open side of the loop against the marauding Welsh! It is also the birthplace of Charles Darwin who has a statue in the town. Shrewsbury is also the setting for Ellis Peter’s “Cadfael” stories. Miss Peter’s actually lived in my hometown of Madeley. I used to be her newspaper boy and delivered a daily copy of the “Morning Star” – very unusual as I don’t think there were many readers of that left-wing paper in rural Shropshire at the time! To the southwest of Shrewsbury we turned onto the A458 towards Much Wenlock. The owner of Leo Farm CL had emphasised the importance of approaching the site via Much Wenlock, as both routes from Ironbridge were steep with hairpin bends and not suitable as towing routes. Much Wenlock is a very pretty, historic market town with a ruined Abbey and other historic buildings. (I was born in the Cottage Hospital there). To reach the B4376 and the Caravan Club’s recommended route to Leo’s Farm CL, we had to drive into the centre of the town where parked cars made for quite tight access. On the far side of Much Wenlock we took the B4376 towards Broseley, and after 1.5 miles we turned left onto the B4375 (signposted Broseley, Ironbridge). These country roads were quite narrow but okay for towing with care. The entrance to Leo Farm CL was on the left, 2.5 miles after the turning onto the B4375. The entrance was clearly marked with a Caravan Club CL site sign and a lion-topped gatepost. The CL was set behind the owner’s bungalow and approached by a tarmac drive. The entrance to the CL itself was through a large metal gate which we had to open to gain access. The site has space for 5 vans, each with a 13amp EHU. There were several hard standing pitches nearest to the entrance gateway and the rest were on grass. The grass was well cut and drained and we chose a vacant pitch furthest from the gate. 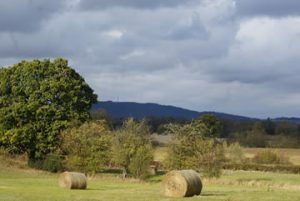 Although Leo’s Farm did not appear to be a working farm, the site is surrounded by pleasant farmland with long distance views over the Ironbridge Gorge and beyond. Although the site is generally flat, we needed to use a ramp to level the caravan widthways. There were no toilet or shower facilities, and no children’s play facilities; however when we visited, it looked like there was plenty of space available for children to play. 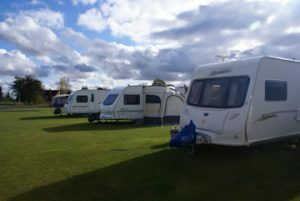 Leo’s Farm is open throughout the year and only open to members of the Caravan Club. The cost of our pitch was £12 including EHU with no additional charges for awnings or dogs. Cary and I stayed for 7 nights with our aged collie Max, during which time the site was very quiet and peaceful. The owner, Norman Wyke, was away on holiday until the last day of our stay but came across to say ‘hello’ when he returned on our last morning. He was a very pleasant and helpful elderly gentleman. There were a few minor negatives about the site. The only toilet/grey water emptying facility was the drain immediately adjacent to the owner’s bungalow. One had to lift the cover using metal rods which proved to be a little awkward, especially for anyone with limited mobility. There is an adjacent tap with a fitted hose to rinse out waste containers. The drinking water tap is right next to the rubbish bins and recycling boxes without any form of screen or barrier, and so it is not very hygienic. One of the other residents regularly allowed his 5 dogs to wander around the site unaccompanied, and on several occasions we found dog mess on our pitch. We mentioned this to Norman when he came to speak to us but by then, of course, it was our last morning and we were preparing to leave. The site is about half a mile from the small town of Broseley which has a small Co-operative supermarket, petrol station and a range of small shops and pubs including a chip shop. There is a new Tesco supermarket in the centre of Madeley, my home town, about 4 miles away. The extensive shopping centres of Telford new town are about 8 miles away. Having levelled the caravan and set the waste, water, electricity, etc, I set up the satellite dish. We did not really need the dish as there is a clear line of sight from the caravan site to the relay transmitter on the Wrekin about 8 miles away. With a height of 1,335 feet, the Wrekin really stands out on the surrounding flat plain. I have climbed the well-worn path to its summit many times. Local legend has it that a giant named Gwendol had a grudge against Shrewsbury and set off with a giant-sized spadeful of earth to dam the River Severn and flood the town. However, he met a cobbler on his way from Shrewsbury Market carrying a sackful of shoes to mend. Gwendol told the cobbler of his intentions and asked for directions to Shrewsbury. The quick-thinking cobbler told Gwendol that Shrewsbury was a long way away and that he had worn out the shoes in his sack walking from Shrewsbury. On hearing this Gwendol is said to have given up his plan and dumped his spadeful of earth, thus forming the Wrekin. The adjacent, smaller Ercall Hill is said to be where Gwendol wiped the mud from his boots. A more likely origin of the Wrekin, however, is that it was formed by a volcano! Unfortunately, setting up the caravan did not go smoothly as the Whale UPO814 inboard pump would not pump the water from the aquaroll to the taps, or to the onboard tank. Despite checking the pump over thoroughly I could not get any response from it. Although it was Saturday evening, I phoned John of Caravancare who services our caravan. 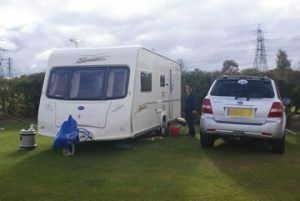 John put me in touch with Roger of Forest Caravan Services – a mobile caravan engineer – located about 30 miles away from the CL. Roger said that he would check out the price for a replacement pump and get back to me the following day. We had to manage by tipping water from the aquaroll into a jug, but this was not too onerous. The following day was Sunday 23 October and we drove to my old home town of Madeley. This journey involved driving down the steep hill into the Ironbridge Gorge, crossing the River Severn and then driving back up the other side of the gorge. We went to the morning service at St Michael’s; the church I had attended in my youth. The church building is very interesting, designed by Thomas Telford and built with a unique hexagonal shape. This design was more in-line with 20th Century thinking as it meant the Communion Table was in the nave. Ironically a chancel was added later to make it a more traditional shape! 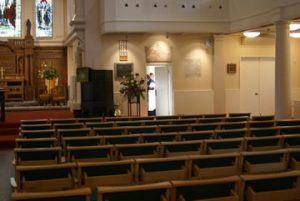 Among the church’s claims to fame is the fact that John Wesley preached there, and the pulpit he used is still in use today. The building has been recently restored internally with the pews of my boyhood replaced with very comfortable upholstered chairs. In addition the whole building is much lighter and more welcoming. We received a very warm welcome from the church members and took the opportunity to visit my mother’s grave in the church yard there. The small town of Madeley was formerly a mining town and still has several pit mounds; although these are now thickly covered with pine trees. Madeley is now part of Telford new town, and much of the lovely countryside surrounding the town has been built upon with 60’s housing developments. The lovely main High Street was closed in the 60’s and replaced with a concrete “Lego” shopping precinct much loved by town planners of that era. After church we visited the town centre. I was interested to see that the town centre had just undergone another “make-over”. Most of the shopping precinct had been demolished and replaced with more tasteful brick buildings, and the high street had also been re-opened. Although not as pleasant as the original, it was a vast improvement on its immediate predecessor. Madeley’s main claim to fame these days is that it is the home to Blists Hill; one of the Ironbridge Gorge Museums. The Ironbridge Gorge Museum Trust has developed 10 museums utilising the area’s former industrial past when it was a centre for iron and other industries. It takes several days to do justice to all of the sites – Blists Hill alone is easily a full day’s trip. In the summer season I think that there are coaches running between the museum sites, as parking is very limited. Tickets can be bought to the individual museums, but the cheapest option is to buy an annual passport ticket which allows the holder to visit each of the museums once within a year. This ticket is quite expensive at £22.35 per adult, although there are versions for families and the over-60’s which offer some further reductions. Full details of the Ironbridge Gorge Museums can be found at the trust’s website www.ironbridge.org.uk. We had visited the museums several times in the past and decided not to do so on this holiday. At Blists Hill – a former industrial site on the outskirts of the Madeley – the Museum Trust has recreated a Victorian town using many buildings re-located from other places. The buildings include a sweet shop, chemist, butcher, pub, several houses and a school. There is also a bank which exchanges £/p for £/d, that can be spent in the town’s shops. The canal which runs through the site has also been partially restored. There are also a number of Victorian industries on the site including an ironworks and a candle maker. The museum is well worth a visit, although I must admit I do begrudge having to pay to enter a site where I used to play for free as a child! At lunch time we heard back from Roger, the caravan engineer, saying that he could replace the pump for over £150, including travel costs. I felt this was rather “steep” and we decided to investigate DIY possibilities. With this in mind we drove to Telford town centre with a view to using the free wi-fi at one of McDonald’s restaurants. Telford town centre consists of several shopping precincts linked by an extensive, and often confusing, road system. We lunched in MacDonald’s and made use of their free wi-fi to investigate local caravan dealers on the internet via our laptop. Some of these dealers were open and I was able to phone them. On Monday 24 October I phoned Whale pumps in Northern Ireland where a helpful engineer explained that the previous horizontal UPO814 pump fitted in our caravan had been replaced with a vertical model, the UPV814. The engineer assured me that it would be an easy swap, but I was not totally convinced. I found that several local dealers had the new pump in stock, but before I actually bought a replacement to fit myself I decided to have one last “look” at the existing pump. While I was doing this, it suddenly began to work again – so time wasted, but money saved; a good result. We spent the rest of the day lounging around the caravan. On Tuesday 25 October, after driving through the nearby town of Broseley, we descended to the Free Bridge over the river at Jackfield. This modern bridge is a replacement of an earlier one and takes its name from the fact that it was free while the Ironbridge was a toll bridge. Near to the bridge is the Tile Museum located in the former buildings of Maws Tile Works. I have a vague memory of being taken to this factory on a school visit whilst at primary school. I must confess that my main memory is eating a chocolate teacake and a bag of crisps in the works canteen! After crossing the bridge we turned left and drove towards Ironbridge. We drove through the centre of Ironbridge village, past the Ironbridge and then along the Wharfage. In bygone days the Wharfage was a busy landing stage for the flat-bottomed boats which carried goods along the river. Nowadays, apart from the visitors, the Wharfage and river are very peaceful. We stopped at the end of the Wharfage at Dale End where a former river warehouse has been transformed into another one of the Gorge Museums; the Museum of the Gorge. As it was a beautiful sunny afternoon, Max, Cary and I enjoyed a walk west along the river bank through Dale End Park. On the edge of the park is the “Valley Hotel”. This hotel, with its beautifully patterned roof, was once the home of the Maws family who owned the Jackfield Tile works at Jackfield. The hotel has particular memories for me as the venue for my brother Pat’s wedding reception in 1976 where I was best man. The park stretches for a considerable distance along the river bank and its many trees were resplendent in their autumnal finery. We passed the football field where I used to play, rather unwillingly, in my secondary school days. The steep wooded slopes of the gorge softened the outlines of the power station cooling towers on the riverbank at the end of the Gorge. After our walk we drove up the Coalbrookdale valley which branches off at end of the Ironbridge Gorge. We passed the former Coalbrookdale High School which I attended for one year when it had become the lower school of the then newly formed Abraham Darby Comprehensive School. It is now converted into the local primary school. The old high school had very limited facilities and these were supplemented by using local buildings. A little further up the Dale I noticed that the former Drill Hall we used as a school gym was now a medical centre. The imposing blue stone institute set up by the Darby family for the improvement of their workers is now a Youth Hostel. As 12 year olds we were allowed to walk unsupervised the half mile from the main school to the Institute for art lessons – less health and safety worries in those days. The Coalbrookdale Company still has its factory at the head of the Dale, making Aga cookers; my dad also worked there for a number of years. This is the site of the Darby factory where the Iron Bridge was cast, and there is another museum and the remains of the original blast furnaces. It is amazing how times have changed in terms of the volume of visitors. When I did a CSE project in the late 60’s on Abraham Darby III, maker of the Ironbridge, the Coalbrookdale Company had a small private museum which was opened by appointment by a retired gentleman. Tourists now arrive by the coach load. After our visit to Coalbrookdale we drove back along the Wharfage and through Ironbridge. We wanted to visit Ironbridge itself but could not find a parking space. We therefore continued along to the Free Bridge, and after crossing the river doubled back along the opposite bank. We parked at the car park on the far side of the bridge on the site of the long-gone Ironbridge railway station. It struck me as ironic that the former rail line from Shrewsbury to Bridgnorth (which ran along the river bank through the Gorge, a victim of the Beeching “cuts” of the 60’s) would have been popular nowadays if it had still been in existence. The evening sunlight bathed the town of Ironbridge and the bridge itself in pleasant hues and I took several photos before crossing the bridge. The nearby Ironbridge toll house with its scale of charges is open to the public but was closed by the time we reached it that evening. The bridge was flat when it was first built, and even my maternal grandmother can remember in her youth in the 1890’s being able to stand by the toll house and look into the door of the “Tontine Hotel” on the opposite side of the bridge. The effect of the movement of the Gorge sides has, however, pushed the centre bridge up to such an extent that one now can only see the hotel’s upstairs windows. Massive works to strengthen the bridge have been undertaken to counteract the constant tendency of the gorge sides to push inwards, and in 1973 a reinforced concrete strut was built across the bed of the river to brace the two abutments. If this had not been done, the bridge would have probably been pushed up so far that it would have, by now, collapsed. We crossed the bridge and spent some time wandering around the mainly tourist shops in the town of Ironbridge. Following this we walked down underneath the bridge. It is obvious from the underside view of the structure of this first iron bridge how much Abraham Darby III copied the contemporary methods used for wooden bridges. As the evening drew on we returned across the Ironbridge to the car and took the very steep minor road which led almost straight back to the campsite. On Wednesday 26 October we stayed at the caravan site as we had invited my elder brother Pat and his partner Annette to visit us for lunch. Pat and Annette are a good deal fitter than us and they walked the 8 miles from their home on the other side of Telford. We spent a pleasant afternoon together before we drove them home again. They were planning to walk home too! On Thursday 27 October we drove into Broseley and had a look around the centre of this small town. I popped in to visit George, an old friend from secondary school who manages the local tyre fitters and whom I had last seen in 1961! I had learned of the location of his workplace from a mutual friend on “Friends Reunited”. We spent a pleasant half hour reminiscing. We then drove down to Free Bridge again, but after crossing the river drove south-eastwards along the gorge away from Ironbridge to the riverside village of Coalport. This had, as its name suggests, been another hotbed of industrial activity in the past. We passed the Inclined Plane, which is now part of the Blists Hill Museum where boats were hauled from the river to the canal above. We also stopped at the original Coalport China factory. In its heyday a number of my relatives worked at this factory, including one who photographed the company’s wares for its trendsetting catalogues. Part of the works has been converted into another one of the Gorge Museums, exhibiting Coalport products. The other part has now become another Youth Hostel. Nearby is the Tar Tunnel which has, too, become another one of the Ironbridge Gorge Museums. This brick-lined tunnel follows a seam of natural bitumen which was used in the past for lamp black, pitch and even rheumatism remedies. With a Gorge Museum Trust ticket it is possible to don a hard hat and explore the tunnel where the bitumen can still be seen oozing from the walls. We walked down to the river and crossed, on what was known to me as a child, the “shakey bridge”. This footbridge is actually Coalport’s very functional memorial to those killed in the Great War. Its nickname comes from the fact that if one stands in the middle of the bridge and pulls hard on the handrail, this mainly wooden bridge does sway quite alarmingly. I must confess I did have a “shake”, for old time’s sake! We then continued our drive through Coalport and recrossed the river on the Coalport Bridge. We stopped for a very tasty and reasonably priced late lunch at the “Woodbridge Inn”, which is on the river bank immediately after we had crossed the bridge. It takes its name from the forerunner to the present bridge which was of wooden construction – again contrasting with its famous iron neighbour. The “Woodbridge” has a lovely location with its lawns stretching down to the riverbanks and was a favourite dining spot of my late mum when, in her later life, we took her out for lunch. The bar and a number of bedrooms overlook the river. We then retraced our journey back to the caravan site. 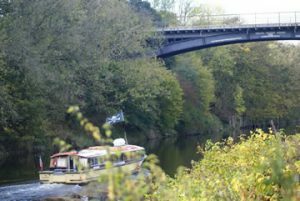 On Friday 28 October, we left the campsite, driving back to Ironbridge and along the Wharfage again to park near the Museum of the Gorge at Dale End. We took the 13.00 hours cruise on the “Ironbridge Scenic River Cruisers” boat “Hafren”, which sails from a landing stage adjacent to the car park. Hafren is the name of a princess said to have drowned in the Severn, and is also the Welsh name for the River Severn – Afon Hafren. There was only Cary, Max and I, plus another couple taking the cruise, and we were made very welcome by the two crew members. The 45 minute-long cruise cost £8 each, including a complimentary hot drink. As there was plenty of room, we were able to sit on the front row of seats near to the boat’s bow. The helmsman turned out to be a local contemporary of mine and we were able to reminisce at length about local characters and events. 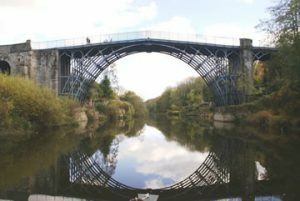 The cruise first sailed westwards upriver as far as the Ironbridge Power Station and under the graceful arch of Albert Edward Bridge, which carries the railway line for trains delivering coal to the power station. Near to the station, the “Hafren” turned back down the river. Passing the Museum of the Gorge and the landing stage where we had embarked, we continued downriver towards the Ironbridge itself. We cruised alongside the Wharfage before the Ironbridge came into view around a bend in the river. The “captain” kindly opened the front doors of the boat so that I could go out onto the bow and take some classic pictures of the bridge and its reflection in the river. After passing under the bridge, the “Hafern” passed the former home of Harry Rogers, who in my childhood days still made traditional coracles – the round boats which had been used on the Severn since medieval times. Eventually the boat turned back upriver and returned to the landing stage. After we had disembarked and were returning to the car, we were serenaded by a robin in the tree above our car park space. I was able to take some lovely photos of the robin in full voice with my 300mm lens. Perhaps I’ll have to produce my own Christmas Cards! We parked in the large public car park near to Sainsbury’s supermarket and walked southwards under the pedestrian arch of the town’s sandstone Northgate and into the main high street beyond. The upper story of the Northgate houses the town museum. Bridgnorth’s High Street is a wide thoroughfare with a range of shops on both sides; modern buildings interspersed with older ones, including some black and white half-timbered houses. In the centre of the High Street is the Town Hall; an elegant half-timbered building set on pillars with an open market hall area underneath and a large clock on its northern face. The Council chambers are open to the public but we did not visit them on this occasion. We continued along the High Street and turned left onto Castle Walk. This elevated footpath affords excellent views over the Low Town, the River Severn and countryside beyond. This vista was one which King Charles I is said to have described as the “the finest in all my domain”. 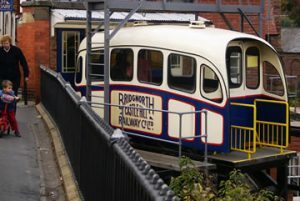 A little way along the Castle Walk is the upper station of the Cliff Railway. Opened in 1892 this railway has since served as a means of transport up the 111 foot cliffs between Low and High town. Originally powered by water pumped to the tank on the roof of the upper car by gas engines, since 1943 the cars have been powered by electrical engines. The original cars were changed to more modern aluminium monocoque ones in 1955, and are now resplendent in blue and white livery. With a gradient of 33 degrees, this funicular railway is said to be the steepest in Britain. We continued along the Castle Walk past the Parish Church of St Mary, which was built by Thomas Telford in 1794, eventually reaching the castle grounds. This pleasant public park houses the ruins of the town’s Norman castle. The castle tower has been left leaning at an incredible angle after being blown up in 1664 during the Civil War, by Cromwell’s forces. From the castle gardens it is possible to see the Bridgnorth railway station and the steam trains leaving on the Severn Valley Line. After a sit-down in the castle gardens we walked back along Castle Walk and took the Cliff Railway down to Low Town. The return fare was a very reasonable £1.20 per person. When we reached the lower station we walked along Underhill Street to view Lavington’s Hole – a series of caves and tunnels dug by Commonwealth forces of Colonel Lavington during the civil war, with a view to blowing up the Royalist’s explosives located in the church above. Fortunately the Royalists surrendered before the tunnels were blown up! We then walked back to the bridge, which was rebuilt in 1823 by Thomas Telford, and crossed over to the eastern bank. On the far side of the bridge is a modern clock tower which has a plaque commemorating Richard Trevithick, inventor of the steam engine, and John Rastrick, the railway engineer who built Trevithick’s first passenger locomotive engine at the nearby Hazeldine Foundry. We bought fish and chips for our tea from the nearby fish and chip shop, recrossed the bridge and ate them sitting on a bench on the restored river quay adjacent to the bridge. After we had eaten, we made our way back to the Cliff Railway station and took the railway back to Castle Walk. We then retraced our footsteps back to the car park. We took the opportunity to stock up on some essentials at the adjacent Sainsbury’s supermarket before driving back to the campsite. On Saturday 29 October, I left Cary at the caravan to begin packing up, and drove to the rail station adjacent to Telford town centre. I had arranged to attend a meeting of the Association of Christian Teachers (of which I am a trustee) in Birmingham, so I took the train into New Street station. After the meeting I took the opportunity to look around Birmingham city centre which I had not visited since the late 70’s. Birmingham city centreI had also arranged a meeting with David and Linda, a married couple, with whom I had been friends at secondary school and whom I had not seen since that time. At the end of the day I caught the train back from Birmingham and drove back to the caravan. On Sunday 30 October we finished packing up the caravan ready for our departure. The CL owner, Norman, had returned from his holiday and popped over to say “hello”. After a pleasant chat we hitched up the caravan and set off home to St Helens. We followed our outward route in reverse and arrived home safely in the early afternoon. We had enjoyed our autumn break in Shropshire; the weather had been generally good, and we had seen some new sights as well as revisiting a number of old favourites. Header banner image credit to August Schwerdfeger [CC BY 4.0 (https://creativecommons.org/licenses/by/4.0)], from Wikimedia Commons.